Welcome to Coastal South Carolina USA! Up and down our beautiful coastline, you can find more fun in a value-filled holiday than you could ever imagine. Whether you are with your family of five, a few foursomes from the local golf club, or on a romantic trip that is a bit overdue - the coast of South Carolina has it all for you. Whether you are looking for a golf break on our championship golf courses of South Carolina or seeking relaxation on our beaches, Coastal South Carolina offers this and more. Fine dining and the best shopping that you can imagine are right here on this dramatically beautiful coastline. The accommodation in Coastal South Carolina are varied to suit every need and budget. You can find luxury hotels in secluded oceanfront resorts, family inns, posh self-cater villas adjacent to the premier Carolina golf courses as well as grand hotels located in the heart of American history. A holiday in Coastal South Carolina can suit every style and every budget. South Carolina's white sandy beaches have been a favorite of American travelers for years and are fast becoming a playground for holiday makers from around the world. The surf is warmed by the Gulf Stream currents from the tropics and our 200 miles of coastline can offer your family a quiet, secluded experience in unspoiled settings as well as active beaches with seaside playgrounds for the entire family. A beach vacation to Myrtle Beach, Hilton Head, and the resort barrier islands of Historic Charleston will surely have you planning your next holiday before you leave. The watersports are too numerous to mention. Whether you fancy a ocean fishing charter to chase a blue marlin in the Gulf Stream or surf fish from the coastline, you will quickly learn why sportsmen from around the world enjoy Coastal South Carolina. Not a fisherman? Not to worry. You can always jet ski, windsurf, or even charter a boat for a sunset dinner cruise. You might even kayak or canoe on an eco-tour to learn first hand what South Carolinians are doing to protect their pristine saltwater marshes. And your children will never forget the experience of catching their first South Carolina blue crab with a piece of chicken, a string, and a net. Are you ready for a game of golf? 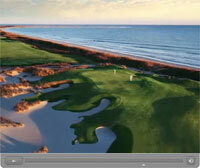 With a golf vacation to Coastal South Carolina you could play a different golf course everyday for months. You'll love playing the golf courses designed by renowned architects like Arnold Palmer, Jack Nicklaus, Tom Fazio, Gary Player, Greg Norman, and Pete Dye. It's no wonder that Coastal South Carolina plays host to annual PGA Tour golf events such as The Verizon Heritage of Golf at The Sea Pines Resort on Hilton Head Island each April. An Kiawah Island Golf Resort ,site of the 1991 Ryder Cup, is set to host our region's first Major, The PGA Championship in 2012. And no place on the planet can match Myrtle Beach golf for its quality and variety of design. Whether your favorite tour professional is Faldo, Langer, Woosnam or Ballesteros, in Coastal South Carolina you can play the same golf courses that your favorite professional has played.